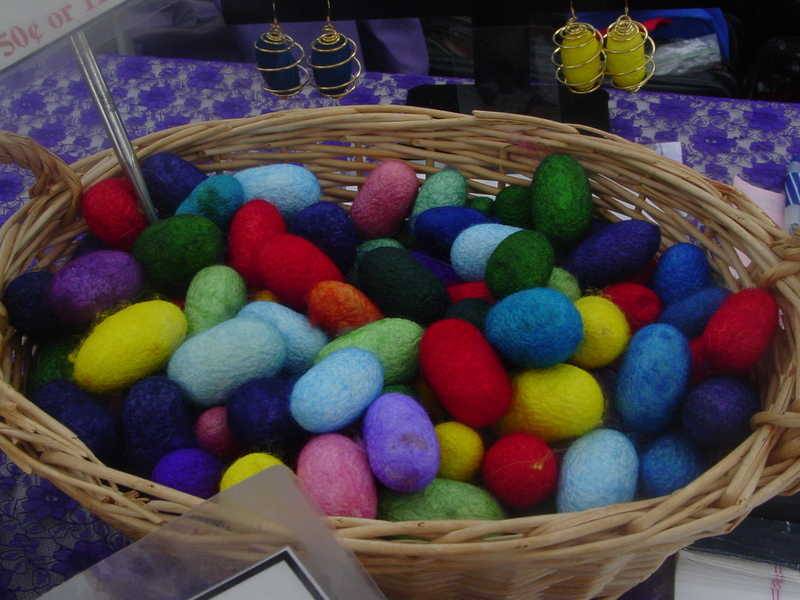 What’s new at the Wednesday market? Mi Fiesta has new lunch specials Wednesday market only! The rain and now warm weather means lots of beautiful greens at the market. And if you want to save some tomatoes for a rainy winter time most vendors have a good deal on case prices. The easiest way to save tomatoes is wash them and stick them in a freezer bag. When you want to use them – just pop them into your favorite soup, stew or sauce recipe. They retain that fresh tomato flavor. MinHee Hill Gardens, Hectors Honey, Armstrong Valley Farm, The Patch, Ponce Farm, Beet Generation, Ridgeview Farm, Farm Sinclair,Sebastopol Berry Farm and Bohemian Well Being Farm. Eleven different produce vendors with everything from soup greens to nuts. Daffodils, Dahlias, Lilies, Oh My! The Village Charter School is currently selling at the Wedneay market. Very locally grown produce. Chef Danielle Steffener joins in the fun at today’s Heirloom Tomato Tasting with fast easy tomato dishes. No Cooking! *In a large bowl combine the crushed garlic, olive oil, lemon and salt. *Here you can decide how big of a dice you like for your vegetables. *Small, Medium or Large.As long as there all about the same size you’re great! *Add all your diced vegetables and mix well. carrots, beets, or radishes will also work. *Decide if you want to peel the zucchini or not.If you want a more authentic looking noodle:peel.If you want to add a little more color: don’t peel! *You can use a spiralizer, spirooli, mandolin or vegetable peeler to create noodles with your vegetables. *If using a vegetable peeler to create noodles, go lengthwise along the zucchini to produce long flat ribbons.Once you reach the seeds turn the zucchini and begin slicing the other side.The seeds will prevent the ribbons from holding together. *Make small stacks of the zucchini’s and slice along lengthwise to create your noodles. *If using a mandolin, be sure to use the julienne style cut. For a smooth marinara place all ingredients except fresh herbs in a blender. *Blend for 1 to 2 minutes adding the sundried tomato soak water to reach your desired consistency. *Taste, add more salt or lemon if needed, then add your fresh herbs and blend briefly to mix the herbs into the sauce. *For a chunkier marinara you can use your food processor. *Add all ingredients and pulse adding a little sun dried tomato soak water as need to reach your desired consistency. Mix with your noodles and ENJOY your fast fabulous fresh creation!! To answer all your gardening questions! vote for your favorite salsa! Daffodils, Dahlia’s, & Lilies Oh My! Min Hee Hill Garden wonderful, fresh and tasty celery. This week the Wednesday line-up includes the gardeners from the Village Charter School Garden. The Village Charter School is located at Luther Burbank Center for the Arts. Each year the students plant a garden and sometimes have enough to sell at the market. During their time at the market, they also handle some of the composting duties. the Wednesday market and right now they have fresh celery. For centuries, aromatic celery has flavored soups and added crunch to salads. But today’s commercial, non-organic celery continuously ranks near the top of the list of vegetables known to carry chemical residues, with some samples tainted with more than 60 pesticides. Purple jalapenos from Farm Sinclair are just a start. Smoked salmon from Fresh Off the Boat and great bagels! 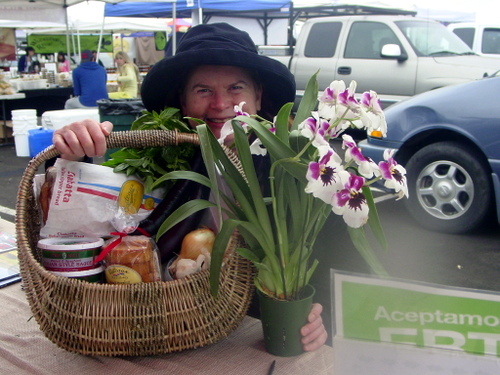 Every month the market gives away a basket full of fresh, local food. It’s easy to enter. Every time you shop at the market, stop by the information booth and fill out a slip for the drawing. September’s winner is Maureen Mannion.